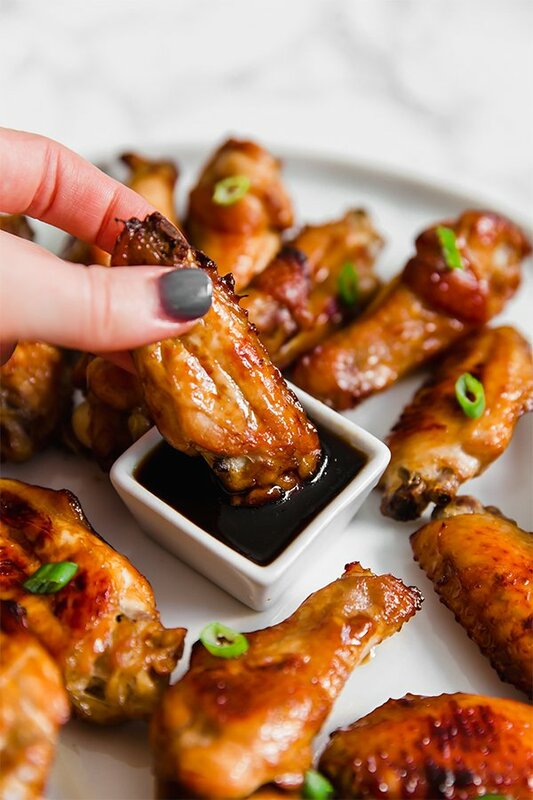 These General Tso style Asian Chicken Wings are addictive! They’re perfect for serving for game day, at a party, or just as a fun dinner. They’re soy free, gluten free, paleo, and AIP compliant. 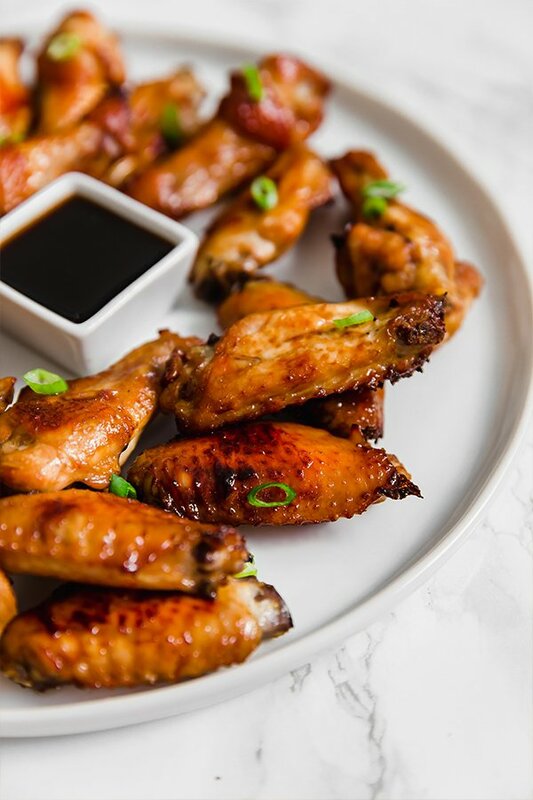 Chicken wings are perfect party food! They’re simple to make, easy to snack on, and you can flavor them so many different ways. That’s why tons of pizza delivery restaurants also carry wings… for days like the Super Bowl! But let’s be honest, your average chicken wings on a menu at a pizza delivery place aren’t going to be food intolerance friendly. 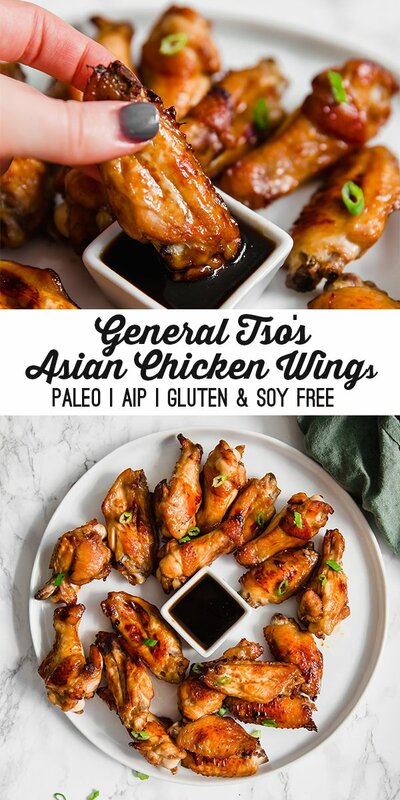 These General Tso’s style Asian Chicken Wings are delicious, easy to make, and soy and gluten free! No soy sauce, no refined sugar, and no cornstarch to thicken the sauce. Make them for a party appetizer, game day snack, or just as a fun dinner. This a soy sauce substitute that you can buy in most health food stores and online. Traditional General Tso’s Chicken has white vinegar, but this recipe uses apple cider vinegar. Most white vinegar is made from corn. This is a secret ingredient in these wings! It makes them super rich and not too sweet. You can also use honey, but I highly recommend blackstrap molasses. Preheat the oven to 375 F and line a large baking sheet with parchment paper. Pat down the chicken wings and set aside. Using a large mixing bowl, mix together all of the liquid ingredients and seasonings, reserving the arrowroot starch. Whisk in the arrowroot starch until well incorporated and the sauce lightly thickens. Set aside about 1/3 cup of the sauce for dipping. Add the chicken wings to the rest of the sauce and thoroughly coat. Place the chicken wings on the baking sheet and brush on any excess sauce. 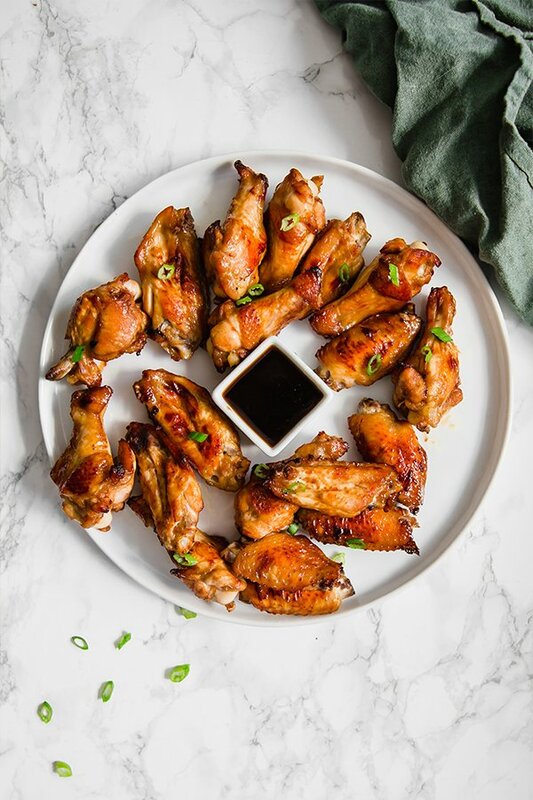 Bake in the preheated oven for 35-40 minutes or until the wings are cooked through. Top with green onion and serve with sauce on the side. I am literally watching the Super Bowl and had to stop to write a review. These wings are amazing, as a former buffalo wing addict, trust me I know! I had not yet found a good replacement for my beloved buffalo, but this is great! I double the ginger powder for a little more kick! Thank you so, so much Danett! I’m so happy you like them! !